Given the news of recent months – the acquittal of George Zimmerman in the Trayvon Martin shooting, the Supreme Court’s invalidation of part of the Voting Rights Act, and controversy over the New York City Police Department’s stop-and-frisk policy – the anniversary of the March may be the unusual event that helps bring the perspectives of whites and blacks closer together. That is Danny Hayes, over at Wonkblog. More here. More from Alan Abramowitz and Ruy Teixeira here. My related posts are here and here. We welcome another guest post from Brown political scientist Michael Tesler. Some commentators have questioned the role of race in the events leading up to the shooting death of Trayvon Martin because George Zimmerman’s mother is Latina—a discussion that has carried over into the comments section of this blog. The fact that Zimmerman is part Hispanic, however, hardly immunizes him from the explicit and implicit anti-black biases that Corrine McConnaughy described in her recent post. Indeed, the figure below suggests that Latinos are actually more likely to stereotype African-Americans as criminals than whites. 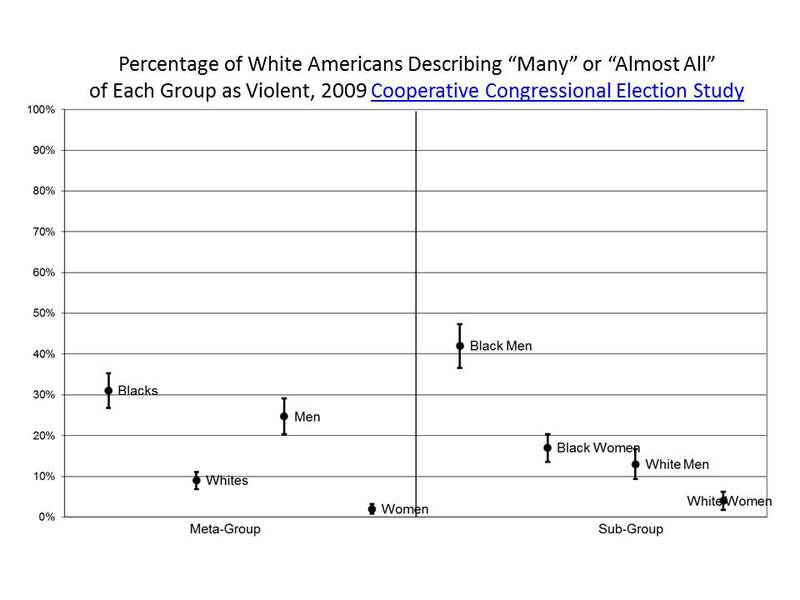 Those results, which come from a 2009 Pew Poll that interviewed a relatively large number of Hispanics (N = 376), reveal that Latinos were much less willing than whites to say “most blacks are law-abiding.“ Only 48% of Latinos, for instance, endorsed that statement compared to 76% of whites. Moreover, the second panel of the display shows that this pessimism among Latinos was limited to their perceptions of black law-abidingness. Three-quarters of the Latinos surveyed said that “most whites are law-abiding.” The display also shows that African-Americans were surprisingly suspicious of their own group’s law-abidingness. 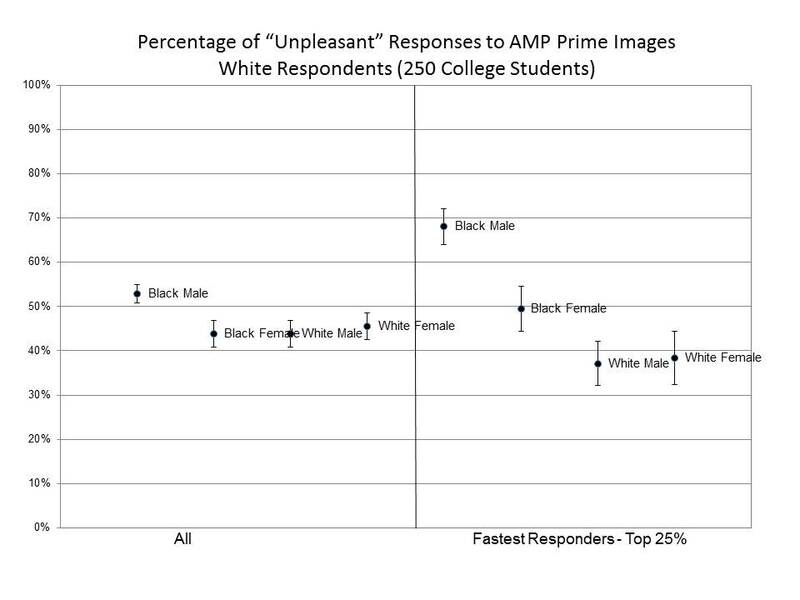 Yet, unlike whites and Latinos, African-Americans were even more likely to stereotype whites as criminals—a factor that may contribute to the wide racial divide in Americans’ reactions to the Zimmerman verdict. To be sure, these results in no way imply that Zimmerman’s actions on the night of Trayvon Martin’s death were racially motivated. They do, however, make it clear that Latinos are just as likely, if not more so, to maintain the stereotypes and implicit biases that could lead to the racial profiling of African-Americans. In New York City, blacks make up a quarter of the population, yet they represent 78 percent of all shooting suspects — almost all of them young men. We know them from the nightly news. Those statistics represent the justification for New York City’s controversial stop-and-frisk program, which amounts to racial profiling writ large. After all, if young black males are your shooters, then it ought to be young black males whom the police stop and frisk. To briefly summarize our findings, blacks and Hispanics represented 51% and 33% of the stops while representing only 26% and 24% of the New York City population. Compared with the number of arrests of each group in the previous year (used as a proxy for the rate of criminal behavior), blacks were stopped 23% more often than whites and Hispanics were stopped 39% more often than whites. Controlling for precinct actually increased these discrepancies, with minorities between 1.5 and 2.5 times as often as whites (compared with the groups’ previous arrest rates in the precincts where they were stopped) for the most common categories of stops (violent crimes and drug crimes), with smaller differences for property and drug crimes. I can’t fault Cohen here, he’s just a newspaper columnist, you can’t expect him to be aware of a six-year-old article in the Journal of the American Statistical Association. And things may have changed since 1998-1999 (which is when our data are from). But the data we have here shows the police were disproportionately stopping minorities. The other thing is, I don’t think Cohen is necessarily being fair to the police when he describes the stop-and-frisk program as “racial profiling.” As we wrote in our paper, “It is quite reasonable to suppose that effective policing requires stopping and questioning many people to gather information about any given crime.” It could well be that a statistical pattern of stops could arise from individual decisions that are not based on race but instead are based on characteristics that are correlated with race. I have no idea what the police are doing—-my only experience here is with the numbers. I that Cohen is, on one hand, way too quick to dismiss the numbers with his blanket statement that “young black males are your shooters” and on the other hand may be way too quick to describe police work as racial profiling. P.S. As a bonus, Slate columnist Matthew Yglesias connects this to one of my other research interests: Bayesian inference. I won’t comment on Yglesias’s remarks except to point out that Bayes’ theorem is a two-way street. The problem here is not so much Bayesian inference as its application to decision analysis. If you have to make individual decisions by maximizing the probability of success (catching a criminal, if you are the police), then profiling can be a logical strategy. Reasons not to profile include, “equal protection of the laws” etc. and also indirect effects of what one might call the “profiling culture,” effects such as hassling innocent people, reducing trust in the police, empowerment of Bernard Goetz and George Zimmerman to go around shooting people, etc. Bayes’ theorem is relevant in all these calculations but the issues here are not trivial.